Park Yard market vendors look on as a grader destroys their stalls. Courtesy photo. PARLIAMENT: A junior minister for Kampala and the executive director for Kampala Capital City Authority (KCCA) have denied authorising the eviction of park yard market vendors. In February park yard market vendors petitioned the Speaker of Parliament, Rebecca Kadaga, over the eviction and asked that Parliament intervenes so that vendors are given opportunity to redevelop the market space themselves. However, before Parliament could look into their petition, the market stalls were torn down and vendors evicted by Ham Enterprises, a private developer who was granted a lease to redevelop the Nakivubo Stadium into a modern sports arena and shopping complex. The February 27 razing of the market left many vendors crying foul, more so because it had been effected very fast on the back of their petition. It seemed to be that the developer was trying to be a step ahead of Parliament just in case the House intervened on behalf of the vendors. But the State Minister for Kampala, Benny Namugwanya, and officials from KCCA, while appearing before the parliamentary Presidential Affairs Committee Thursday morning, washed their hands of the controversial manner in which the takeover was done. Kampala ministry docket, which works under the all-powerful Presidency, and KCCA are direct superintendents of the Nakivubo property. The committee which is handling the petition of the vendors accuses the two institutions of failing in their supervisory roles. MPs on the committee accused the government of disregarding a February 27 KCCA council resolution calling for a halt to the eviction process until Parliament had pronounced itself on the matter. The executive director of KCCA was represented by her deputy director in charge of policy and advisory services, Charles Ouma. He told the committee that the city authority “did not authorise or participate in any manner whatsoever” in the demolition of Park Yard Market. This step-back led Nakawa Municipality MP Michael Kabaziguruka to conclude that the ministry, with Minister Beti Kamya playing a lead role, acted outside the ambit of KCCA and the law. “And if KCCA is not involved then it means that the ministry is engaged in illegalities because the act of just demolishing would require express authority from the planning authority of KCCA,” Kabaziguruka said. Namugwanya deflected the accusations levelled against her office, saying the ministry merely implemented a Cabinet decision of October 19, 2016. On that day, Cabinet resolved to restore trade order in the city by evicting traders operating on streets, road reserves, unlicensed open spaces and other illegal locations. Minister Benny Namugwanya (left) with the Kampala Lord Mayor Arias Lukwago at a past event. Courtesy photo. 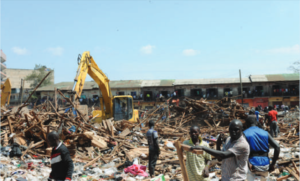 However, the junior minister noted that following an eviction notice the ministry had served to the vendors, the market leaders agreed with the developer to leave the premises and allow for redevelopment. Namugwanya insisted that this understanding between the two parties was reached without the government’s coaxing, saying the latter had decided to withdraw from negotiations to relocate the vendors. She said the vendors were later betrayed by their leaders who probably entered into a quiet agreement with Hamis Kiggundu, the tycoon behind Ham Enterprises, without consulting their colleagues. “Because their leaders agreed and signed a document which they handed over to our office indicating that they have agreed to shift even before the 30 days [deadline]… this was very clear,” Namugwanya said. The minister said about 4,000 vendors were displaced by the eviction of whom 2,200 have since been relocated to alternative markets like USAFI, St Balikuddembe and Wandegeya. Those not accounted for in the relocation exercise chose to go their own way, she added. President Museveni promised the vendors Shs2 billion to ease their relocation but this is yet to be effected. Earlier this month, the vendors again sought Parliament’s intervention in ensuring they received the pledge. Amuria Woman MP Susan Ameru, who chaired Thursday’s committee meeting, said the MPs will make an impromptu visit to the various markets the vendors were relocated to ascertain the exact number of those affected, and whether the ministry has handled their situation in a satisfactory manner. The Park Yard Market saga dates back to 1999 when the board of trustees of Nakivubo War Memorial Stadium attempted to repossess the land in vain. They then instituted a court case against KCC which had advertised a tender for applications for management of the market. The town clerk of the then Kampala City Council (KCC) Gordon Mwesigye in January 2000 conceded that KCC had no jurisdiction over the market, subsequently KCC and the management of the stadium entered into an arrangement to formalise the operations of the market. KCC would collect market dues from the vendors where 30 percent of the dues would be paid to the and 70 percent to KCC. KCC outsourced the responsibility of collecting the dues to Equator Catering Services. This contract was, however, struck down by the High Court as illegal in a 2007 civil suit between KCC and Equator. Since the KCCA came into force on March 1, 2011, no dues had been collected from Park Yard, according to Ouma, and the market was deemed to be a temporary trading area. The city authority also took the view that the existence of market activity as well as the structures in which the market operated constituted an illegality for lack of the requisite permissions and approvals. The City Director of Physical Planning, in a December 9, 2013 status report on Park Yard Market, recommended that the area was not a gazetted marketplace. The management of the nearby Nakivubo Market, during all this time, had engaged in protracted negotiations with several government agencies and ministries to try and wrest control of Park Yard from the vendors. President Museveni, in a February 16, 2015 letter to the former Education and Sports minister, Maj. Jessica Alupo, directed that the minister discusses a proposal by Hamis Kiggundu to redevelop the area and build a sports arena. “Another thing that interested me was that he is sure of his own finances to redevelop the stadium without burdening government,” reads the President’s letter in part. The Cabinet decision to evict traders operating in illegal spaces followed a year later in October 2016. On February 20, 2017, Namugwanya’s boss, Minister for Kampala Beti Kamya gave the vendors 30 days to relocate to USAFI market and other markets. The eviction took place under heavy police guard and way before the 30-day ultimatum had elapsed, courting speculation that it was hurried so as to defeat an impending court injunction halting the redevelopment of Nakivubo Stadium. On March 13, 2017, KCCA approved plans by Ham Enterprises for the redevelopment of the sports arena, pavilion, multi-level parking and introduction of commercial spaces along the outer boundary line. Rapid reconstruction is currently underway.